My brother and I thought we were going to die on the ride home from Hinckley, Minnesota last Friday. As soon that night’s Legacy card ended, we left the Hinckley Grand Casino and drove into the prelude to an apocalyptic Midwest summer thunderstorm. Lightning flashed all over the brooding gray sky, silent and menacing like ninjas flashing their blades in a dark windy forest. When it was finally unleashed, the storm stopped semis in their tracks and lowly sedans sought out bridges to hide underneath. Zero visibility. Water seeping in through cracks in the chassis. We rode on through the storm in silence, his eyes riveted to the tiny strip of white that defined what was left of the road, and my mind drifting back to the card. It was an event that rose to a raucous crescendo only to end on a somber note. Two fighters in particular stood out for me, both off of the prelims. That’s not to say there weren’t other great fighters that showed some promise out in Hinckley, but for our story, these are the two. Bobby Lee was the first. He strode down the short plank from the backstage wrapping rooms to the cage and a whole section of the audience stood up and released war cries. Local kid. His cheering section was mostly lily-white wrestle-heads peppered with thuggish-looking tattooed ethnics. That’s small town Minnesota for you. Lee walked through his opponent with a nigh on seamless combination of precise Muay Thai and overwhelming American wrestling. At most amateur shows the fights are raw guts and fence swinging. Who’s willing to take it all and give more? But Lee put on a technical display and it won him the fight handily. 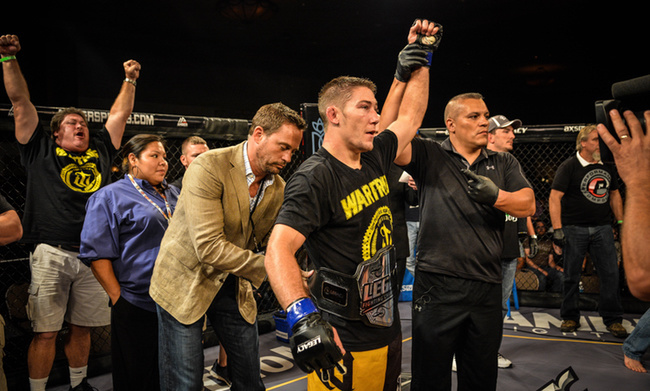 The next fighter was Tyler Mathison. The same section stood up when Tyler came out and so I stopped helping my brother look for his car keys and paid attention. Another technical, skilled victory for whoever that section represents. Both Lee and Mathison could one day show up in the big leagues, that’s how superior their mixed martial arts game looked that night. 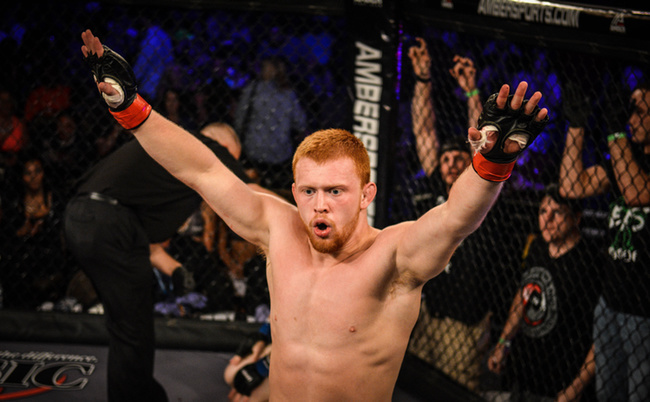 Mathison struck well with a better striker, was patient, and took his man down with perfectly timed level changes. It was the poise that really struck me. A lot of guys rush in at these small town shows, pumped up for a big fight, furious at a host of demons, internal and external, that needs be decimated. So stoked to finally be under the lights and fighting before an increasingly rowdy crowd, before mom and dad and fans. A big performance here, on nationally televised AXS TV, and suddenly people start talking about you. You don’t have to be the best fighter on the card, you just have to look the best. After Mathison’s victory I went up to the section and started asking around. Jessica Bednard took a break from cheering and answered my questions. St. Cloud. Figures. That place has a reputation in the Twin Cities as being two-thirds wrestle-head, one-third thug. I sit down next to Larry Love, who is also wearing a Performance Compound shirt, and ask him about St. Cloud. Love and Bednard go on to talk about Larson and the gym and how they’ve learned there. Makes sense. Larson is a decorated wrestler and fighter who competed in the UFC, defeated Mike Pyle, then suffering a cut after just two losses. Some of these guys out of the Midwest wresting world (Brainerd, MN to be exact) get cut not because they can’t win, but because they win ugly. Sweaty demoralizing victories over flashy guys, like slugs crushing butterflies. 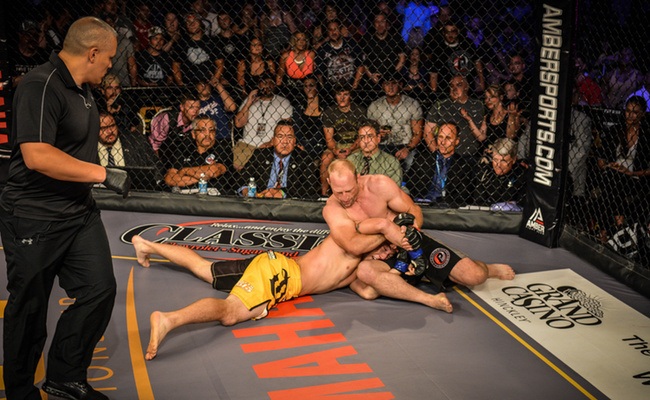 Brock Larson is defending his Legacy Welterweight belt in the main event against a Texan named Derrick Krantz. His gym mate, Jacob Volkmann, is the co-main. Volkmann another wrestler from northern Minnesota who competed in the UFC. He went 4-2, beating Danny Castillo and Efrain Escudero. His last fight was a submission loss to Bobby Green in the third round. Cut. Why? Because Volkmann grapples his way into your soul, grabs dominant position, and holds it there until your spirit caves. That’s what Volkmann does to Zak Ottow in the co-main, putting him to sleep early in the fight. The St. Cloud/Northern Minnesota/Wrestler contingent is now howling. Brock Larson is next and the crowd smells another soul-theft coming. Brock and Derrick square off and it’s apparent that Larson’s stand up game is just his ground-and-pound game on two feet—strong and awkward like a seal out of water. Krantz survives Larson’s bread and butter Kimura twice. He steps over and keeps his arm from being snapped off, but he’s hurting. It looks bad for the Texan. He’s barely avoiding the bum rushes on his feet, and barely keeping his arm intact on the ground. But as the fight goes on, Krantz reveals that he can wrestle his way out of Larson’s soul stealing grip. Seems this is going to be decided on the feet. And it is, when a looping left catches Larson on the jaw in the third round and he crumples. The contingent goes silent like Jabba’s henchmen when Luke kills the Rancor. But there is no gang boss to call for blood, no one to set up an execution for the man who would dare troll this party. Krantz appeals to the crowd in a polite Southern way, but they’re already milling about, picking up bags and shrugging at each other with defeat in their eyes. It’s a blow that resonates. Larson has to face his team the next few days and they have to face him, this defeat between them. Myself, I’m surrounded by the fury of God with my brother in a car on Hwy. 35, and all I can see through the rain on my window is Brock Larson staggering away from the cage as quickly as he can, and the looks on Larry and Jessica’s faces as they pack up and leave.